A couple of years ago 500W power supplies were considered very high-end but these days ultra high-end gaming PCs use a lot more power. Dual-core and quad-core processors along with a SLI or CrossFire setup of NVIDIA's GeForce 8800 Ultra or ATI's Radeon HD 2900 series can use a lot of power, especially when these components are all heavily overclocked. Power supply makers were pretty quick to market power supplies with maximum outputs of 750W, 1000W and even 1200W - even though most people and even most computer enthusiasts don't need so much power. 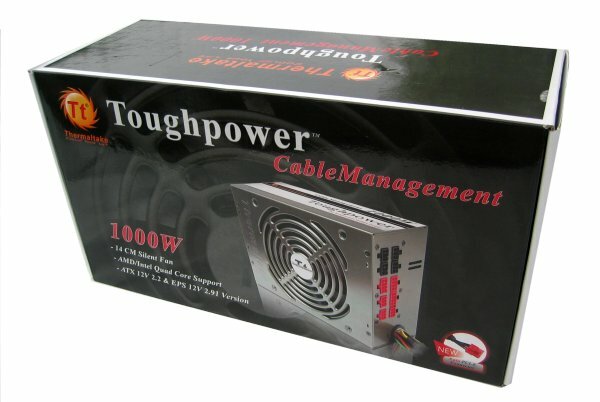 In this review I'm taking a closer look at the ThermalTake Toughpower 1000W power supply with modular cable management. 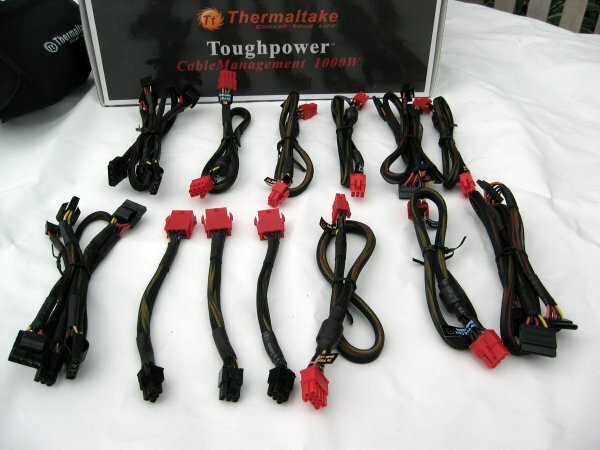 ThermalTake's Toughpower PSU lineup is available with standard and modular cables with max outputs ranging from 550W to 1500W. 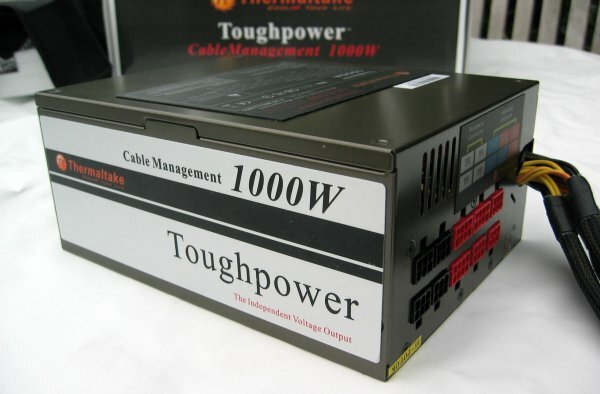 The Toughpower 1000W CableManagement PSU features four +12V rails which output a max current of 86A. It's cooled by a large 140mm fan and according to ThermalTake the PSU has an efficiency of up to 87%. Inside the box you'll find the power supply, a short manual, a bag with the modular cables, a box with an AC input power cord and a plastic bag with four mounting screws and a silicon noise dampening pad. This pad can be placed over the back of the PSU and should reduce vibrantional noise, ThermalTake claims on its website that the noise preventive silicon pad effectively reduces vibration noise by as much as 80%. 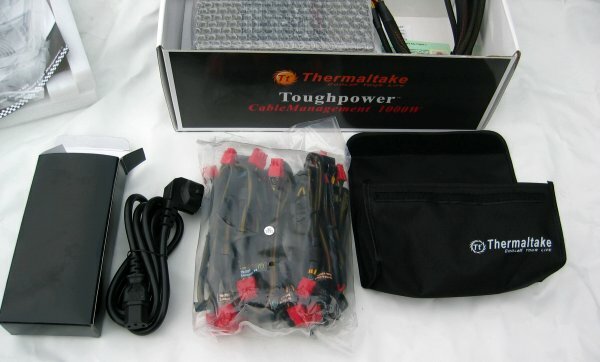 High-end power supplies like this one from ThermalTake typically feature a higher gauge power cord. It's a good idea to switch your old one with the one included in the box to ensure that your PSU will be able to draw enough current out the AC socket. And here's a look at all the cables which ship in a black bag. 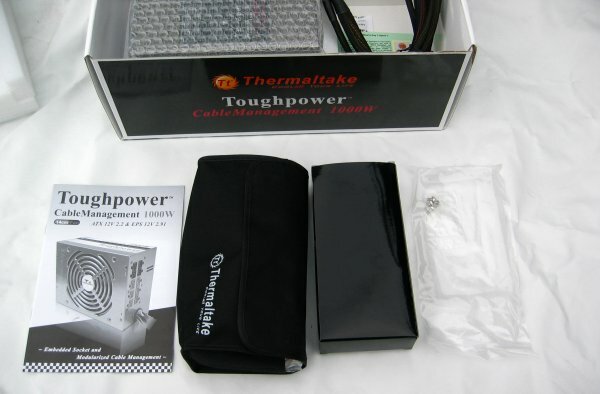 Earlier revisions of this power supply didn't include this bag but ThermalTake decided to ship this bag together with the PSU to make it a bit easier to store unused cables. 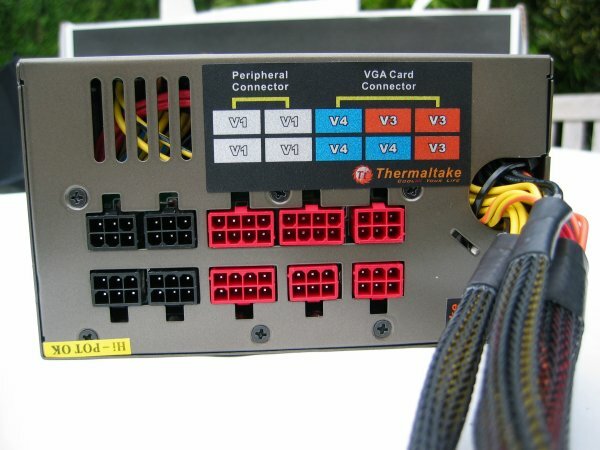 There are thirteen modular cables: two cables with 4 Serial ATA power connectors on each cable, three 8-pin PCI Express connectors, three 6-pin PCI Express connectors, three 8-pin to 6-pin PCI Express cables and two cables with four Molex connectors and a floppy disk connector. All cables are nicely sleeved to improve the airflow in your case. Now lets take a look at the PSU unit. Like I expected this 1000W power supply is a bit bigger than power supplies that provide less juice. This could make it impossible to install the PSU if you have a small case. Even in large cases it may give a problem, if there's a top fan you may need to remove this fan in order to create enough clearance for the power supply. ThermalTake says the PSU has a hi-tech black coating but that's a bit misleading, the coating of the power supply looks bronze/dark brownish. As you can see on the photo the power supply features a big metallic label on the left side of the unit. And here's a look at the back of the PSU, as you can see this power supply isn't fully modular. The 20+4 pin main power connector, 4+4pin +12V power connector and 8-pin power connector for quad-core CPUs can't be removed but that shouldn't really be a big disadvantage. This power supply features four +12V voltage rails so you have to be careful that you don't draw too much current from each voltage rail. The first and second +12V voltage rails each provide a max current of 20A and the third and fourth voltage rails both provide a max of 36A, with a maximum combined load of 82A. Fortunately ThermalTake took care of this problem by labeling each connector on the back. 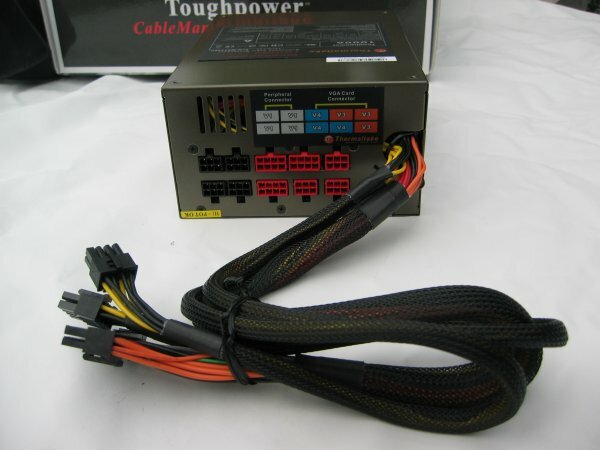 The first four connectors are on 12V1 and are used for peripherals like hard drives, DVD burners and other devices that use 4-pin Molex or Serial ATA power connectors. The 12V2 line is used to power the motherboard and your processor and voltage line 3 and 4 are used for your graphics card(s). This should balance the load a bit over each voltage rail.